The 2017 Honda Pilot is a versatile family crossover with off-road capabilities. This dynamic SUV can deliver your kids to soccer practice and help you bring every piece of gear you could possibly need. With outstanding towing capacity for a vehicle of this class, you can also bring along your favorite outdoor recreational toys. The quiet and well-appointed cabin has ample room for up to 8 passengers and their gear. Impressive safety features and user-friendly technologies perfectly round out the 2017 Honda Pilot. This impressive crossover is the choice for families on the go! When it’s time to test drive a 2017 Honda Pilot near San Bernardino, CA or near Rancho Cucamonga, CA, put Rock Honda at the top of your list. We stock a vast inventory of both new and used vehicles, and we are especially proud of our 2017 Honda Pilot inventory near San Bernardino, CA and in the Inland Empire. With in-house financing available, we can make the paperwork a breeze. Our state-of-the-art repair and service department offers many specials so you can keep your vehicle in tip-top running order. We look forward to meeting you and your family soon! 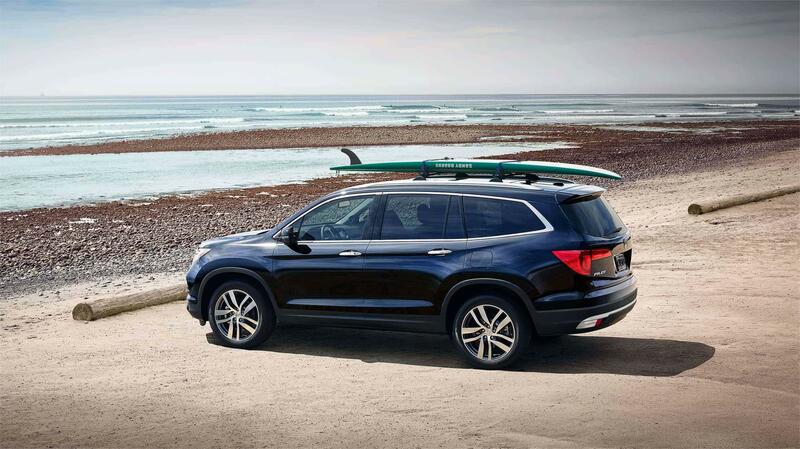 The 2017 Honda Pilot in Fontana, CA comes well-equipped with many popular standard features. A standard 5-inch color LCD screen, or an available 8-inch high resolution electrostatic touch screen, keeps all vital information at your fingertips. The standard tire pressure monitoring system with tire fill assist, as well as location and pressure indicators, can warn you in advance of potential tire issues before they become a hazard. You won’t have to stop to ask for directions again with the turn-by-turn directions you get with the available navigation system on some models (dependent on trim level). Forward collision warning and lane departure warning are also optional features to allow for increased safety while driving. The 2017 Honda Pilot is the crossover of the future- and it’s available today! Power is never an issue with the 2017 Honda Pilot. The V6 direct fuel injection, 24-valve SOHC i-VTEC® engine features an aluminum alloy engine block and cylinder head, and is standard on all models of the 2017 Honda Pilot. This engine delivers up to 262 lb.-ft. of torque, along with up to an incredible 280 horsepower. A 6-speed automatic transmission is also standard equipment. Or you may opt for the 9-speed automatic transmission with shift-by-wire (SBW) and paddle shifters, which is available on the Touring and Elite models. Our sales staff at Rock Honda in Fontana, CA is standing by to put you behind the wheel of one these powerful and dependable SUV crossovers. You may find the 2017 Honda Pilot can be one of the best investments you will ever make for your family, so stop by today to learn more.